Preheat the oven to 180°C/gas mark 4. Put the tomatoes and mozzarella in an ovenproof dish, brush with 2 tbsp olive oil. Season. Bake for 8-10 minutes until the tomatoes split and the mozzarella starts to ooze. Meanwhile, cut 2 x 6mm-thick slices of aubergine and brush with 1 tbsp olive oil. Brush a hot griddle pan with 1 tbsp olive oil and cook the aubergine for 2 minutes each side. Season. Place in a shallow ovenproof dish. Mix the vinegar and sugar with 1 tbsp water and pour over the aubergine. Put in the oven with the tomatoes and mozzarella for the last 2 minutes cooking. 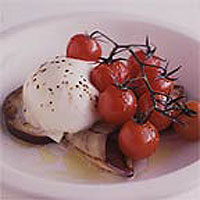 Serve the tomatoes and mozzarella on top of the aubergine, sprinkled with extra virgin olive oil and salt. This dish is delicious with a little pesto, or croutons topped with tapenade.